Raising brown bear cubs is a difficult and challenging task. Cubs demand constant attention and their hunger is nearly insatiable. Mortality rates for cubs are often high too, as cubs can drown, die from illness, or be killed by another bear. Cubs in their second year, called yearlings, are larger, stronger, more independent, and less reliant on mother’s milk for calories than younger cubs, but their survival is still tied to mother’s success. She needs to take her yearlings to areas where the family can gain sufficient fat to survive winter hibernation. Bear 451 provides us with examples of the struggles, challenges, and even successes of mother bears at Brooks River. We saw 451 persevere through a persistent leg injury and remain for days at the side of her dying cub in 2015. Now, 451 is currently raising her second litter, and it’s easy to see that the family is skinner than many of the other bears on the bearcams. Although many bears use Brooks River to fish for salmon in early summer, not all of them know how or are willing to fish at Brooks Falls. While notable exceptions exist, this is especially true of mothers with cubs. While raising spring cubs last summer, 451 generally avoided the area near Brooks Falls, choosing to fish downstream far more frequently. From my observations this summer, 451 continues to fish the cut bank area, but we’ve also seen her make conspicuous forays to the falls. When doing so she’s sometimes been focused on stealing fish from other bears rather than staking claim to a fishing spot. Stealing is a legitimate fishing technique in the bear world, but it is fraught with risk. Other bears are often unwilling to relinquish their catch, so attempts to steal can result in injury to both bears. Stealing can also be an indication that the thief is hungry, as more well fed bears usually don’t employ it. However, 451 has also shown indications that she’s experienced days of abundant food, when she was relaxed and energetic enough to play with her cubs. Mother bears are consistently skinnier than single females and large adult males. While a mother bear doesn’t purposefully share fish with her cubs, she is often tolerant of her cubs’ effort to take fish from her, leaving her with fewer calories for herself. 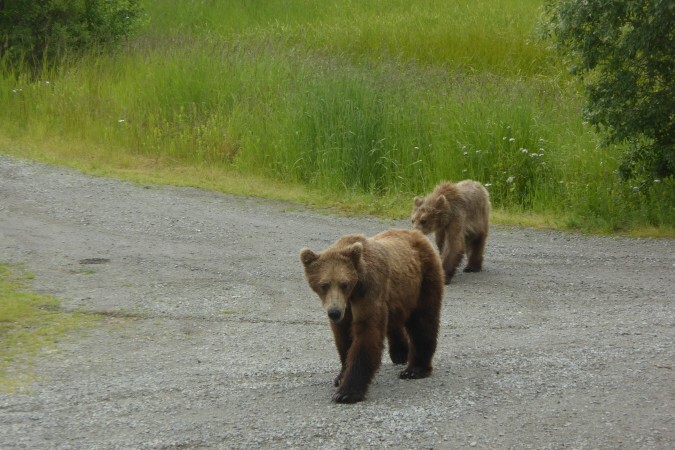 Mother bears also spend far more time being vigilant, keeping a careful watch for possible danger and threats to her family, compared to single bears. Without the energetic burden and costs associated with raising cubs, single bears are able to devote all of their resources to themselves, and consequently grow much fatter. Large and fat bears can skew our expectations of what bears should look like. Males like 32 Chunk and 747 and single adult females such as 128 Grazer and 409 Beadnose sit at the upper end of the fatness index. Summer remains somewhat young though, and we can expect 451 to continue to gain weight. As salmon begin to spawn and die in large numbers, fishing will only become easier for mother bears and their cubs. Dead and dying salmon will also be more dispersed, reducing the competition for space that we currently see at Brooks Falls. 451’s current body size demonstrates her energetic challenges. Rare glimpses of her playfulness illustrate the days when she’s been more successful in finding food. Mother bears make many sacrifices for their offspring, not the least of which is body fat. In order to raise and protect her cubs, 451 will experience many more days of feasts and famine, but if she’s protected her offspring well enough to survive this long into their second summer then the odds are in favor of her continued success. so you dont think, 451 health is bad , means it have a kind of illness( because she vomited a few days ago) and that may cause her skinnyness and that it more stealing fish than catch by its own? The cams did catch footage of 451 vomiting several times, so she might have been experiencing an illness. Her overall size though, isn’t uncommon for mother bears at this time of the year, so I can’t attribute it any illness at this time. Thank you for your insight into 451’s behavior. It was so sad to see her so desperate for a few days to find food. I hope she & the family have moved on to a better place for them to find food. To my knowledge she has not been seen at BF in over a week since the fish stealing video. Thank you Mike, it gives me hope that she and her cubs will be fine. I realize this is nature, but there are nuances that you have gleaned through your years of bear studies that are very logical, and I appreciate you bringing them to the forefront. Again, it gives me hope for that family. Thanks Mike for sharing this persepctive with us. We benefit from your many years of observation, study of their behavior and your personal experiences with these bears. Information like this does help us to understand and appreciate the struggles and the success that they face. Every season and litter she has will makes her a stronger and more confident mother. I continue to remain positive for their health and success.